To prepare this jewel of a cigar case for exhibition, lifting and detaching moose hair and splits in the birch bark had to be stabilized. 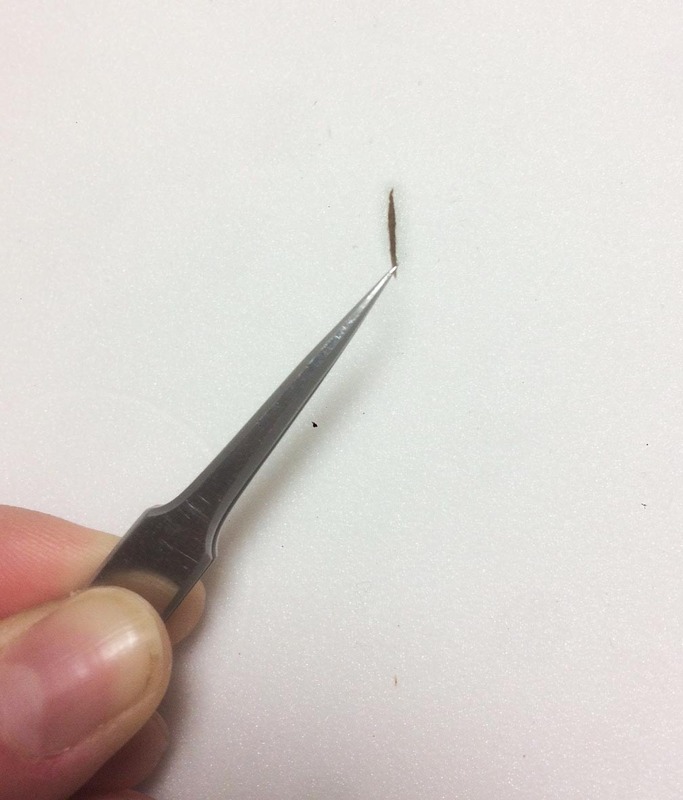 Some of the lifting moose hair was stabilized with dabs of 5% methyl cellulose. 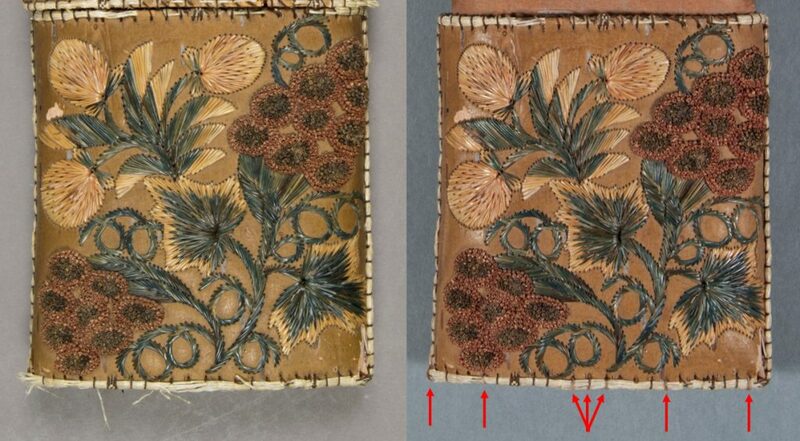 For the lifting moose hair around the edges of the case, much of this damage was exacerbated by the missing brown thread stitches. For these areas, after re-positioning the moose hair, I recreated the missing threads with twisted Japanese tissue paper fibers, toned with acrylic paint. The fibers were adhered in place with Lascaux 498, an acrylic emulsion. Unstable splits in the birch bark were repaired from the interior with Japanese tissue and Lascaux 498. Additional support splints made of twisted Japanese tissue fibers were added to the exterior in one place on the lid. 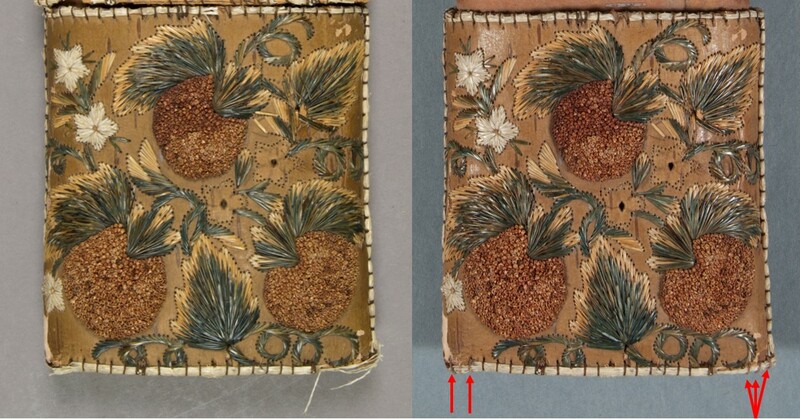 Before (left) and after (right) treatment images of the lid. The red arrows indicate the location of the split and the repair splints used on the exterior. 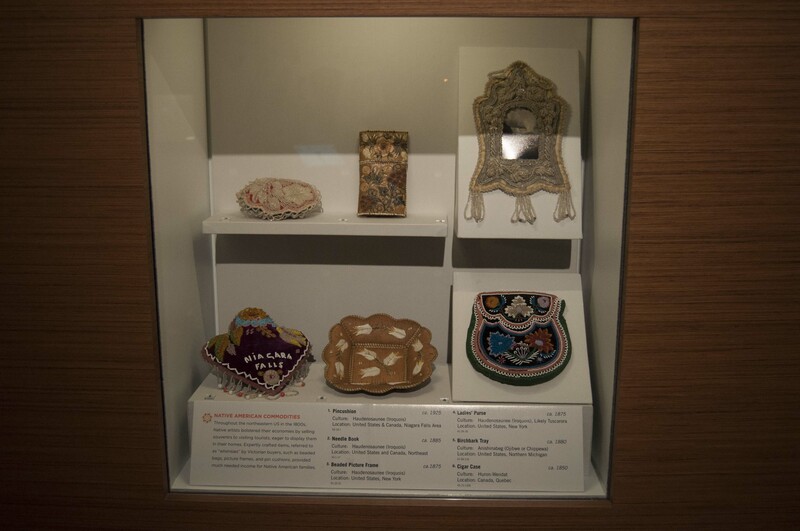 The cigar case is now on exhibit in our Native American Voices gallery. I only learned after it was installed that it dates to 1850 – much older than I realized! Its age makes it an even more remarkable piece. This entry was posted in conservation treatment, Objects In the Artifact Lab, on exhibit and tagged birch bark, cigar case, Huron, Japanese tissue, Lascaux 498, methyl cellulose, moose hair, Native American Voices by mollygleeson. Bookmark the permalink.